In 2011, Lake Ontario Waterkeeper created Swim Guide to answer the simple question, is it safe to swim in Lake Ontario? By combining government data with technology, the public can now answer that question for themselves, whenever they want. Today, with water quality information for over 7,000 beaches and in 4 countries, over 5,000,000 people around the world have better access to swimmable water. 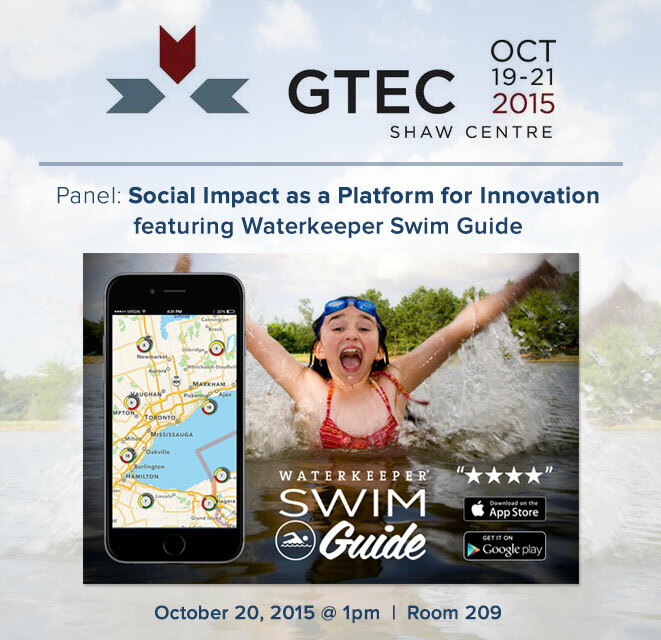 Waterkeeper is proud to present Swim Guide at this year's GTEC Conference in Ottawa at the Social Impact as a Platform for Innovation panel. Waterkeeper Vice-President and Swim Guide co-creator, Krystyn Tully and Foci Solutions' Shan Gu will discuss the opportunities for social innovation when non-profit, private, and government work together through Open Government initiatives. Swim Guide is one example of how such an integration can address a social need. The GTEC Conference attracts over 925 participants from both the public and private sectors. This knowledge and professional development conference features thought-provoking keynotes, seminars, panels, workshops and round-table discussions on a comprehensive selection of ICT topics presented by leading public sector and industry experts.